Synthetic peptide corresponding to Human Glypican 4 aa 1-100. SH-SY5Y, 293T, and K562 cell lysates. Our Abpromise guarantee covers the use of ab168364 in the following tested applications. WB 1/1000 - 1/10000. 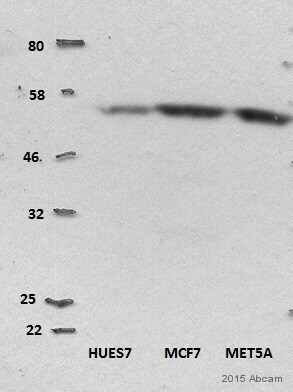 Predicted molecular weight: 62 kDa. Cell surface proteoglycan that bears heparan sulfate. May be involved in the development of kidney tubules and of the central nervous system. Belongs to the glypican family. 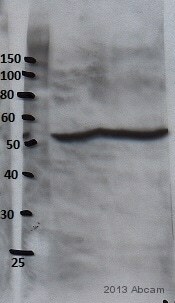 Detection of Glypican 4 by Western Blot of Immunprecipitate. 293T cell lysate immunoprecipitated using ab168364 at 1/10 dilution; HRP-conjugated anti-rabbit IgG preferentially detecting the non-reduced form of rabbit IgG. Publishing research using ab168364? Please let us know so that we can cite the reference in this datasheet.